Virginia Tech and BYU jumped into the Top 25 after big wins in Week 2. The college football calendar turns to Week 3 with some teams picking up steam in the national spotlight after big wins last weekend. We turn to our panel to sort out which of those victors are contenders and which are pretenders. 1. Virginia Tech is coming off its upset of Ohio State in Columbus. Are you buying or selling the Hokies as a contender this year? ♦ For the moment, I’m selling. Yes, the Hokies got a big win on the road against Ohio State. However, how good is Ohio State? The Buckeyes needed a second-half comeback to get past Navy two weeks ago, and then they gave up 14 unanswered to an unranked opponent at home in the fourth quarter last Saturday. What’s more, the Hokies’ remaining schedule doesn’t do them any favors. As of this writing, they have no more games against ranked opponents this season. If they can remain unbeaten up to the Pittsburgh game on Oct. 16, then we might be able to reopen the conversation, but not yet. ♦ Sell. Sell. Sell. And that's not just because I went to Miami. Virginia Tech has been in this spot before. Let me take you back to 2008. The Hokies were No. 17 in the nation facing this week's opponent, East Carolina, to open the season. ECU beat VT 27-22 in Charlotte. They ALWAYS seem to lay an egg in a big spot -- you can even throw out the last couple years when Beamer Ball wasn't exactly what we've been used to seeing for more than a decade. The schedule certainly favors the Hokies since they miss Clemson and Florida State, but road games at UNC, Pitt and Duke will not be easy. ♦ That's exactly why the Hokies have to be in the conversation -- VT's schedule. Strength of schedule is not a factor for the College Football Playoff. Now, whether that's a good thing or a bad omen, it's another topic. As it stands now, Virginia Tech has its national-TV-audience win and regardless of how "good" Ohio State is, the Buckeyes were in the game, snatched defeat from the jaws of victory -- but a lot of that was because of the defense that VT played. ... Yes, Virginia Tech is in the conversation. Yes, there is a lot of football to be played. No, I don't believe the Hokies will be one of the four vying for the national title. Mark Spoor: But does one win -- or one loss for that matter -- make you a contender or take you out of the mix? I guess for the purposes of conversation, maybe. Doug's point about past performance is spot-on. We've seen this movie before. The question is will we get the alternate ending this time? For me, the jury is out, but I'm still selling. Duane Cross: One loss will -- ask Michigan State, ask Stanford; those teams will need a lot of help to get into the final four. And it's conceivable that Arizona State or Virginia Tech could leap-frog either or both of those teams and then it would be even more difficult. ... Good point, Doug -- VT has history with floating an air biscuit and ruining the moment. I think most folks can see at least one road loss for the Hokies. 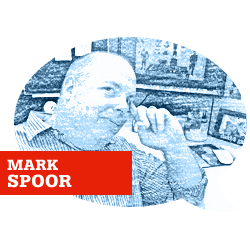 Doug Kroll: Yep, Mark. And that's the beauty of the College Football Playoff. Until a loss, Hokies fans can parade around thinking, "Why not us?" I will say this: Beamer has a quarterback in Michael Brewer that he hasn't had in quite some time. He's not a Vick brother who can basically outrun defenses, he's not a Logan Thomas, either. Maybe that's what he's needed all along since the defense is always stout. Mark Spoor: But does anyone truly believe strength of schedule won't matter? I know it's not supposed to, but how can it not? Duane Cross: Because a one-loss team -- regardless of who the L came against -- isn't going to stack up against an undefeated. Not in the first year of the CFP; schools would lose their minds! Undefeated Pac-12, ACC, Big 12, SEC team ... and a one-loss Big Ten -- that's a no-brainer. Mark Spoor: But what if there are no unbeatens and more than four one-loss teams? What becomes the determining factor then? Doug Kroll: The road to the CFP for Virginia Tech is easy: win out, beat Clemson or Florida State in the ACC title game. Strength of schedule will not matter. The Power Five conferences got their wish and if the Hokies are undefeated -- with only playing two ranked teams all year -- so be it. Mark Spoor: I would say their road is simple, Doug. Easy is another story. Duane Cross: Perceptions will be a determining factor. Already the grave is being dug for the Big Ten; losses to Oregon and Virginia Tech by Michigan State and Ohio State -- the flagship teams in 2014 -- don't bode well. 2. BYU and Notre Dame are nationally ranked. Which team -- if either -- is poised to remain in the hunt for the long haul of the season? Mark Spoor: If I had to pick one, I’d lean toward the Irish. Everett Golson is a big-time playmaker and seems to have gotten better since his hiatus. Yes, I know Michigan isn’t exactly Michigan these days, but Notre Dame handed the Wolverines their first shutout loss since 1984 on Saturday -- that’s 30 years for all you math majors out there. To do that in a rivalry game has to say something about how the program performs in big spots. Yes, there are concerns about the Irish running game, but if Golson keeps improving and they take care of the football like they did last Saturday, that weakness would be minimized. Duane Cross: I'll take BYU; the Cougars' schedule is much more conducive to running the board than Notre Dame. The Irish still have Stanford, Florida State, Arizona State, USC -- and toss in North Carolina and Louisville. Doug Kroll: I love what BYU has done as an independent when it comes to scheduling. Trips to Texas, UCF, Boise State and Cal. Now, some of the teams they scheduled are in a 'down' year, like Virginia for coming into Provo on Sept. 20. That means BYU is going to have to run the table to remain in the hunt. On the flip side, Notre Dame has land mine after land mine following its games against Purdue and Syracuse. How about Stanford, UNC, FSU, Navy, Arizona State for a five-game stretch? Ouch. Gimme BYU to stay ranked all year. Mark Spoor: I'll say this: If the Irish can survive that gauntlet and stay in the hunt, whatever the College Football Playoff may throw at them shouldn't bother them, that's for sure. Duane Cross: Brian Kelly has his work cut out this year, no doubt. Notre Dame's schedule is not set up for a top-four finish. Now, neither is BYU's; not a lot of marquee wins on the Cougars' side with Middle Tennessee and Savannah State in the final month, when you'd like to hang a nice win on the board for those keeping score. Undefeated? It is too soon to say; Notre Dame's remaining schedule is loaded with tough opponents. Doug Kroll: Depth may become an issue for Notre Dame, too, after losing some key contributors during fall camp. It's been a nice start, but I don't see it continuing. BYU will continue to rise thanks to others losing. I'm not saying they are a final four team, but the Cougars will finish above the Irish. Book it. Duane Cross: Agreed -- BYU finishes ahead of Notre Dame in the final poll. That said, it's nice to see BYU getting some love. Anytime you can roll out the Jim McMahon clips, it's a good day. Doug Kroll: Especially when they've kind of been left behind in the arms race that college football realignment has become. They are free to schedule who they want, when they want -- if they'll play them. Mark Spoor: Very true, Duane. The Super Bowl Shuffle rules! Seriously, to Duane's point about BYU's late-season schedule, you want to make sure your team is battle-tested, particularly late in the season when everyone has a better idea of what everyone else has got. Notre Dame will know what it has come November. 3. What's it going to take for the Big Ten to turn around its early season woes and have its conference champion vie for a shot at the playoff? Doug Kroll: Start scoreboard watching teams from other conferences hoping for a whole bunch of losses? No Big Ten team owns its own destiny anymore -- obviously. A team like Michigan State is in the best shape of anyone, having the 'best' loss of any of the Big Ten teams the first two weeks and a relatively easy schedule. If Sparty can run the table against a manageable conference schedule and enough teams from the Pac-12, Big 12, SEC and ACC aren't undefeated, why not? Mark Spoor: More than anything, I think the Big Ten has to get tougher and they have to take care of the football much better. Michigan State looked great for a half against Oregon, then looked totally gassed when it mattered most. Ohio State collapsed in the fourth quarter at home against Virginia Tech and Michigan committed three big turnovers on Saturday night in South Bend. I do agree with Duane’s early point that the Big Ten's grave is being prepared. I imagine practices have not been fun for anyone in that conference this week. Also, I think the conference is going to need a lot of help from forces it can't control. Spartan Nation- Despite the loss to Oregon, I was happy with @MSU_Football's performance and I think we are going to have a great season! Duane Cross: Ohio State must beat Michigan State on Nov. 8. The Spartans still have Nebraska (Oct. 4) and Penn State (Nov. 29). Ohio State is at Penn State on Oct. 25 and if the Buckeyes win that one, there is a chance, depending on the Big Ten title game, to get back into the CFP mix. But Ohio State has to take care of its business, beat the teams it's supposed to -- and whip Michigan State. Doug Kroll: I think there are so many moving parts that it's really hard to zero in on one Big Ten team that may still have a chance to reach the final four. It'll change week-to-week, game-to-game. And that's why this thing is going to be so amazing. Mark Spoor: It is going to be a lot of fun, that's for sure. How the Big Ten responds to last weekend's whippings, I think, may go a long way in determining just how much fun it will be. They all have a point to prove, no doubt. Can they prove it is the question. 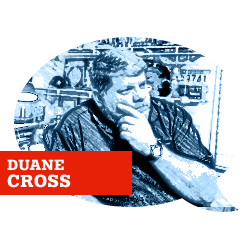 Duane Cross: Indeed, Doug -- we're all throwing crap against the wall to see what sticks. Fact is, it's kids playing ball; who knows what will happen. Injuries, turnovers, upsets -- there are a lot of unknowns waiting to be revealed. Can the Big Ten prove it -- yes. The question is, "Will the Big Ten prove it." It's on these kids, just as it was in Week 1 and Week 2. So let 'em play. Doug Kroll: I think the problem with 'let's see how the Big Ten responds' is, the first two weeks happened. And the pundits, committee members, fans alike won't be able to wash that taste out of their mouths. It'll hurt and sting all year, even if one or two teams get hot -- it'll still all come back to "Wisconsin lost to LSU!" ... "Ohio State lost at HOME to Va. Tech!" ... etc. Tough to wash that off. Mark Spoor: Unless those teams that won the early games lay eggs down the road, then that taste may get a little mouthwash. 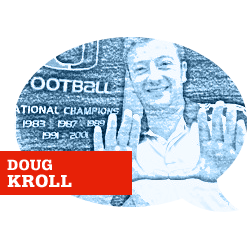 Doug Kroll: Not enough good teams in the conference for that to happen. It was that bad, Mr. Sparty.